The Edit is a cost-effective way to bring a subscriber-boosting perspective to the paper, but what about the young journalists whose work it uses? 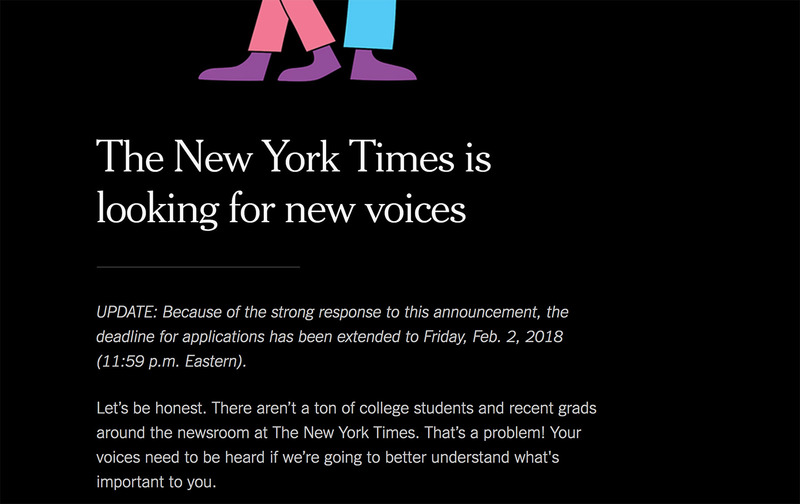 In January, The New York Times quietly announced that it was hiring five early-career writers to contribute essays to The Edit, its newsletter for students and young professionals. If you’re a young journalist in the United States, it’s likely that you applied. The news quickly spread online; friends texted friends and students excitedly discussed it over coffee and on social media. The response so overwhelmed the paper of record that it extended the deadline and hosted a live Q&A session with Lindsey Underwood, who edits the section. By the February 5 deadline, more than 20,000 young people around the world had applied. The buzz surrounding The Edit surprised many, including Underwood, who told The Nation she was “blown away by the response.” But for many young people working in the media, the competition was no surprise. It’s another gig, a part-time job, a résumé-booster, and a chance to market your “personal brand”; for many young people entering today’s workforce in any field, it’s a familiar experience. The Edit will undoubtedly help the five young writers (or possibly more) the Times chooses, but after their year-long contract is over, they will most likely be thrust right back into the low-paying content aggregation jobs and endless internships that are part of the eternal quest for media success—the very same media landscape that opportunities like The Edit wind up helping preserve. The Times has a justifiably legendary status. You would be hard pressed to find any writer adept in English who would turn down an opportunity to write regularly for the Gray Lady. But the most respected media institutions have few opportunities available for early career journalists. Unfortunately for young people, many of the the media companies hiring them are those that the American public—and the industry itself—respect and trust the least. The number of journalists employed at traditional newspapers and magazines has been on a long-term, two-decade decline. With it has come an overall loss of union protection (notwithstanding recent trends) as digital media startups, short-term contracts, ubiquitous freelancing, and declining salaries and benefits spread. An early-career post at the Times, even as a limited contributor to a newsletter, would give young journalists a leg up for permanent jobs. It also could provide an all-too-rare way out of the gig economy, the equally praised and detested system that has oozed out of tech startups to transform the media industry. And she’s right. That door-slam can appear as a successful blogger telling kids to pack it up and go home. But it can also look like a national paper of record—whose total revenue topped $1.7 billion last year —mining a few young people for their marketable perspective and expertise without much regard for the wider media landscape it unquestionably influences by doing so. The Times can afford to shrug when their deft, and likely cost-effective, move reinforces the low-paid, “opportunity”-driven job market that young writers, little more than glorified contract workers, must overcome. The Edit’s five positions are part-time and remote, based on a short-term, one-year contract. The Times also has not published how much it will pay contributors and did not answer The Nation’s request for clarification. People of color and young working class people disproportionately fill part-time, low-pay positions and are often forced to take several of them to make payments on student loans and to eat. A student from a rich family is much more likely to have the time to spend writing applications for gigs like The Edit—or have the connections to even hear about similar efforts—than a struggling student juggling three part-time jobs. And a student with three part-time jobs doesn’t have the luxury of giving one up for a position that doesn’t tell you beforehand how much it will pay. It’s difficult to read about The Edit without placing it in the context of the Times’ campaign to court young subscribers. Through on-campus student brand representatives who sell subscriptions and market the paper, its Modern Love essay contest, the expansion of its On Campus section to include more student voices, and its popular mobile app, the paper has tried to convince young readers to pay for its journalism. The strategy seems to be working: In 2016-2017, online interaction from millennials increased by 9 percent year-on-year. The stereotype that young people won’t pay for news is fortunately false, at least when it comes to the Times. While The Edit’s relaunch will likely be a great opportunity for the five chosen contributors, it will have even greater benefits for the publicly traded New York Times Company. A major reason why young people across the ideological spectrum are turning toward digital media sites staffed with young writers is that they see their own perspectives and voices affirmed there. The Edit announcement was thus a singular PR coup and a smart business move: The paper gets to prove that it cares about students while keeping costs down through temporary employment. The newsletter likely gained thousands of sign-ups throughout the application window. If even a handful of them were converted into paid subscribers, it could help offset the program’s limited cost. As I have outlined before, it is beneficial for both young people and media companies to form partnerships that train and employ young writers. National publications like the Times, most of which are based in New York, can use young journalists’ deep knowledge of their local beats to aid national coverage and avoid so-called parachute journalism. Underwood, herself a product of a college in the Midwest, crucially highlighted in the Q&A video the importance of bringing in regional and international voices to the Times. (None of the questions, notably, addressed pay.) In another welcoming sign, Underwood also emphasized that she viewed the initiative as a “partnership,” where contributors would help shape the newsletter’s content. 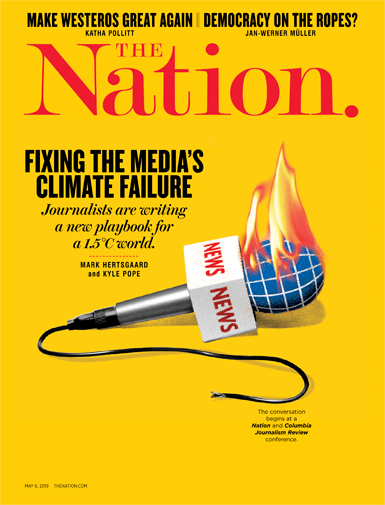 “We have many readers who are in college or who are recent graduates, and we want to ensure that their voices are represented in our journalism,” Underwood told The Nation. “The Edit seemed like an obvious place to provide a platform for them.” If the paper’s annual, two-week-long Student Journalism Institute, where it publishes and trains aspiring writers of color, is any indicator, contributors can expect to be taken seriously. But it begs the question: How can the media create sustainable and fair opportunities for young journalists facing a job market more unforgiving and tenuous than ever before? It’s easy and even fashionable to criticize the Times for its elevation of Trump supporters’ voices and its questionable columnists, but it’s hard to ignore the overwhelmingly positive response that the Times received for the Edit announcement. Twenty-thousand applications in three weeks is nothing to scoff at. As young writers and readers, let’s hope that the paper of record makes good on its promise to support young people with reliable work: full-time jobs and appropriate pay. If it fails, it will risk alienating those 20,000 applicants—and their friends.